The bizarre creature consisted of a whole, full-sized lamb, which lived suspended from the ground by a small stem! Hindsight is a wonderful thing, isn’t it? Imagine the embarrassment we could all save ourselves, if we could see how silly some of our ideas would turn out to be before we committed to them. At the same time, though, that would make for one heck of a boring world. Where would we be without brilliantly outlandish theories? 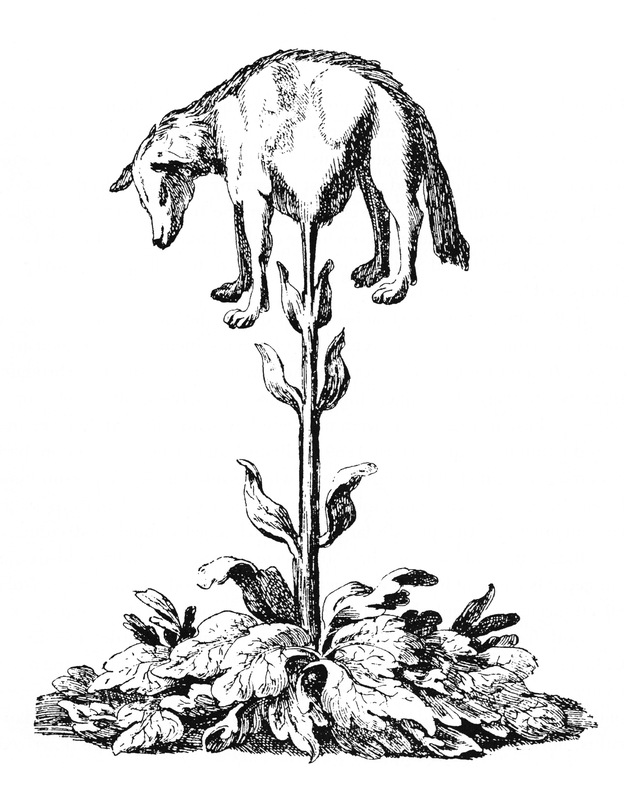 The legend of the Vegetable Lamb of Tartary is a prime example. For centuries, people believed that lambs were an odd sort of animal-plant hybrid that grew on trees! Clearly, a good dose of context is in order with this one, so let’s start at the beginning. The Middle Ages were a long and puzzling period of history, stretching from the fifth to the fifteenth centuries. It was a time of political upheaval, of endless strife and conflict; both within nations and on the world stage. It was a time of new discoveries and technologies, and science attempting to run to catch up with it all. Needless to say, science often found itself sorely lacking. Theories that should have seemed absurd just couldn’t be disproved, gained traction and became widely accepted as truth. The bizarre Vegetable Lamb of Tartary is just one of them. At the time, Tartary was the name of a great chunk of Central Asia/Europe. This, according to the stories, was where this very special creature could be found. There were believed to be two distinct varieties of Vegetable Lamb: a bizarre plant that produced tiny lambs inside pods, and an equally-bizarre hybrid creature that consisted of a whole, full-sized lamb, which lived suspended from the ground by a small stem! Needless to say, it’s not easy (and it’s certainly not practical) to be a strange, stem-suspended lamb-plant. 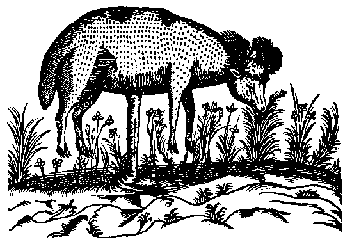 The Vegetable Lamb of Tartary was said to be able to move around, in a limited way, from its stem, allowing it to graze on vegetation. When there was none left within its reach, the poor, freakish thing would starve and die. Its stem (think of it as a sort of nightmarish umbilical cord) was also vital to its survival, and should it be cut, it would also die. It wasn’t an easy beast to hunt, however (even aside from the fact that it doesn’t actually exist), as some records state that it needed to be separated from its stem with perfect precision. This would be done with a bow and arrow from afar, apparently. Alternative takes on the tale speak of the Jadua, a similar mythical creature with the characteristics of a human which grew like a plant! This aggressive beast would use its stem to seize and attack any who strayed within its reach. 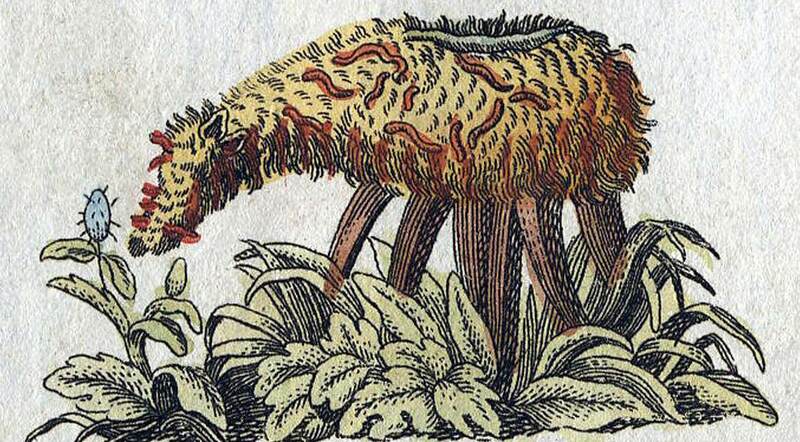 As outlandish as this all may seem, it wasn’t until the 16th century that anybody really questioned the existence of this mythical plant/animal hybrid. Italian thinker Girolamo Cardano argued in the 1550s that an undersoil environment would be too cold for a lamb to survive the growth process. Nevertheless, travelers and explorers continued to claim that they had seen the Vegetable Lamb of Tartary for themselves, and so the belief persisted for a little longer. In short, forgeries seemed to be fueling continued belief in the phenomenon. “The myth had simply arisen from overactive imaginations and faked specimens, and probably a fair number of wine binges on the trade routes, to be quite honest,” Wired concludes. In the end, it’s important to note that this whole thing isn’t as peculiar as it may sound. 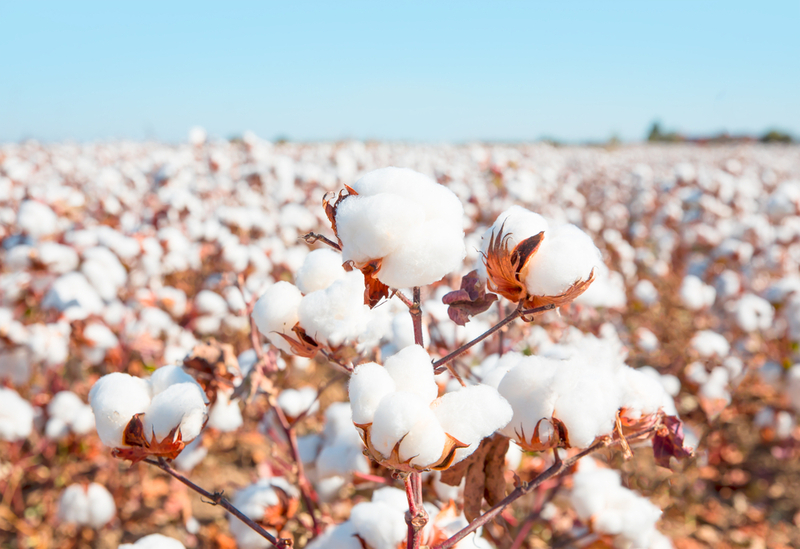 After all, the people of Ancient Greece had never experienced cotton before, until discovering the “trees that bear wool” that are its source. It’s not as simple as just a case of people of past eras not understanding the world, either. As recently as 1957, the BBC broadcasted footage of people tending to spaghetti trees (which supposedly bore the pasta) as an April Fools joke. Brits, unfamiliar with pasta at the time, called into the show in droves, asking how they could grow their own spaghetti trees. Thank you, I enjoyed this story. Thank you, I enjoyed reading this story about lambs growing on trees.